Whenever I’ve taken my first, tentative steps into a new literary culture, I’ve simply gone straight for a few seminal texts, hoping to get a taste for the style from some good examples. However, once I have more of a feel of what’s going on, I always like to try a short-story collection, as it can give you a small taste of more writers (and can often show you where the next port of call should be). 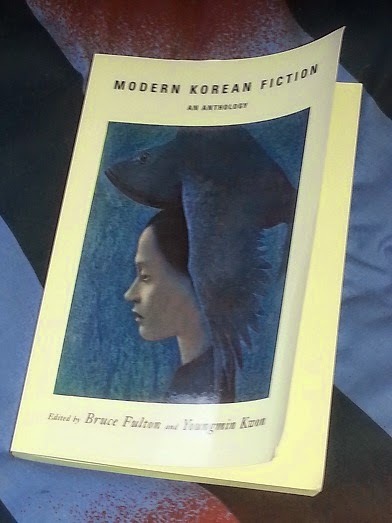 Modern Korean Fiction (edited by Bruce Fulton and Youngmin Kim, published by Columbia University Press, review copy courtesy of Australian distributor Footprint Books) was released back in 2005, but it still seems to be a good place to start if you’re looking for Korean short stories. It contains twenty-two pieces, arranged chronologically from the colonial period to the late nineties, and it’s great value for money too, running to a good 380 pages. As you’d expect, there’s a fair sprinkling of big-name authors around. Writers included whose work I’ve already tried include Kim Young-ha, Yi Mun-yol and Cho Se-hui (in fact, the stories included by those last two writers have already been read and reviewed on the blog!). However, there are several other well-known authors who were new to me, as well as a whole host of brand-new names to discover. ‘Wings’ is a great story and beautifully written. It comes as no surprise to find that Yi Sang lends his name to one of Korea’s most prestigious literary awards. This rural tale is nicely balanced by Ch’oe Yun’s ‘The Gray Snowman’, a story set in the capital. It depicts a few months in the life of a young woman in the 1980s, caught up in the underground protests against the harsh rule of the government. It’s one of the better stories here, and the subject matter definitely has shades of Shin Kyung-sook’s recent novel (in English), I’ll Be Right There. The last of the female-written stories is definitely up there as best in show. O Chong-hui’s ‘Wayfarer’ (tr. Bruce and Ju-Chan Fulton) focuses on a woman just released from some kind of hospital. Over the course of the story, we slowly learn why she was there as well as finding out about her life since being discharged. The writing is excellent, and the story is a detailed, psychological insight into both the protagonist’s issues and the social constraints which are used to tie her down. I've wanted to track out a copy of 'Wings' for a while but in it's single edition, (published by Jimoondang in a different translation), the price has been way too high, so good to know that it's available to read in this anthology, which is available at a fraction of the cost, thanks for posting on it. I've a couple translations of Korean Literature to read soon – Yi Mun-Yol's 'The Poet' and Jan Eun-Jin's 'No One Writes Back'.